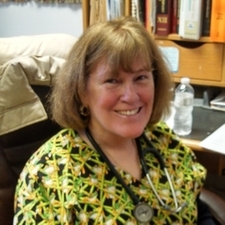 Dr. Shaughnessy grew up in Brookfield, Wisconsin and first came to Hartland Animal Hospital in 1979 as part of her training to become a veterinary technician. She worked with Dr. Schumann and his staff to complete her associate's degree. When her parents were relocated by her father's company to Oklahoma she followed to enter the veterinary program at Oklahoma State University since there was no college of veterinary medicine in Wisconsin at that time. 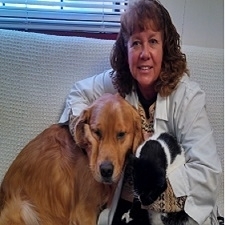 She returned to Wisconsin in 1990 and bought Hartland Animal Hospital in 2012. Dr. Shaughnessy's great passion is raising and training golden retrievers. She has been raising goldens for show, hunting, and performance purposes since 1994 and loves training and showing her own dogs. She has been a licensed AKC judge in conformation since 2008 and has traveled extensively judging and exhibiting dogs. Dr. Shaughnessy's great passion is raising and training golden retrievers. She has been raising goldens for show, hunting, and performance purposes since 1994 and loves training and showing her own dogs. Dr. Pratt graduated from Purdue University in 1979 and has practiced in the Milwaukee area her entire career. In 1995, she started the East Towne Cat Clinic and practiced feline only medicine until her retirement in 2010. Since retirement, Dr. Pratt has practiced part-time relief and is enjoying devoting her entire time to practing medicine with a special interest in the treatment of kidney disease and diabetes in the cat. Dr. Mary shares her life with 3 grown daughters, 3 dogs and a cat. She enjoys horses, running her retail shop and horse showing. 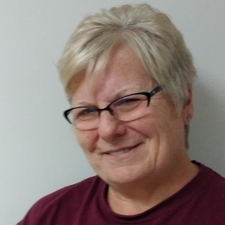 Wanda is a native of Pittsburgh Pennsylvania and has been in Wisconsin for over 20 years. She completed a business course at Bradford School of Business and then transferred to Point Park College where she worked as an Administrative Assistant to the Dean of Admissions and continued her education in Business and Early Childhood Education. She also did volunteer work with a fire station after receiving her EMT licence. 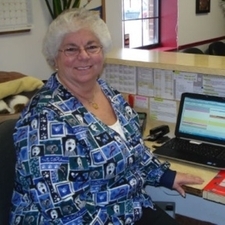 Wanda has held several management positions over the years, and started at Hartland Animal Hospital as a receptionist. She quickly moved into her current position as Office Manager less than a year after she was hired in 2004. Wanda enjoys being with her family and friends and loves to work in the yard in her spare time. She shares her home with her husband and 2 kitties, Daisy and Gillie. A Hartland Animal Hospital employee since 2002. Scott graduated with honors from Kettle Moraine High School and received further education at UW Whitewater and along with other Hartland Animal Hospital employees, receives continuing education in the veterinary field from conferences and online seminars throughout the year. 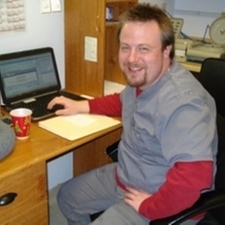 In addition to patient care, Scott is also responsible for maintaining inventory. Scott has a Golden Retriever, Ellie, and in his spare time, he enjoys spending time outdoors-weather permitting of course, and listening to music. Helena joined the clinic in February of 2007. She came to us with a legal secretary degree from Byrant & Stratton Business College. 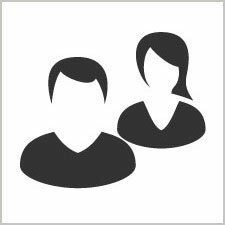 Over the years Helena has used her skills in law firms, banks, and as a fast food manager. After 10 years in the fast food profession she decided to start her own business. That is when Helena's Gourmet Delights, Inc started. She specialized in greek pastry and appetizers and distributed to some of our local grocers. Helena retired her business after 13 years. After taking a few months off, she decided she would like to get back to administrative work. Her skill, love for animals, and a special place in her heart for German Shepherds brought her to us. When not at work she enjoys her 3 children, 5 grandchildren (2 more on the way), gardening, and is very active in her church. When not at work Helena enjoys her 3 children, 5 grandchildren (2 more on the way), gardening, and is very active in her church. Rylee grew up in Sussex, WI where she graduated from Sussex Hamilton High School with high honors. 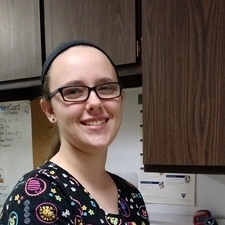 From there she decided to go to college at Milwaukee Career College to become a Certified Veterinary Technician where she received a full scholarship for her academic achievements. Rylee graduated in June of 2017. Rylee's personality and education are a great fit for us and we are very excited to have her on board. At home she has 4 cats, Raja, Jasmine, Twitch, and Lila and one dog, Wyatt. WELCOME BACK JERI!! Most of our clients will remember Jeri from back in the 1990's. 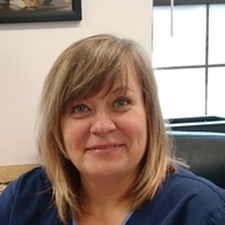 Jeri worked at Hartland Animal Hospital for many years, and we couldn't be happier to have her, and her many years experience back with us. She is looking forward to reconnecting with clients from her earlier years, and meeting new clients and their 4 legged family members. Apart from caring for various pets on her retired dairy farm, Jeri enjoys hunting, fishing, and winter sports.